Targeted and precise genomic gene editing technologies are the tools for genomic correction, modification and gene therapy. The TALEN, ZFN and CRISPR/Cas are the three main genome editing technologies. The lately discovered, so called the third generation of gene editing technology, the CRISPR/Cas (Clustered Regularly Interspaced Short Palindromic Repeats) technology has (1) higher targeting accuracy; (2) much more target sequence selection; (3) much less complexity; and (4) much less off-target cell toxicity than the previous genome editing technologies: TALEN (transcription activator-like effector nuclease) and ZEN (Zinc-finger nuclease). The CRISPR/Cas and CRISPR-associated (Cas) endonucleases were discovered in E Coli and have since been developed into a powerful technology for genomic editing, making possible highly specific genome modifications far more quickly and economically, and was listed as one of the top 10 breakthrough discovery in 2013. A target sequence-specific guide RNA molecule (gRNA) directs a Cas endonuclease to the genomic DNA target sequence. Then, the Cas enzyme creates a double-strand break at the target sequence that can be repaired either by Non-Homologous End-Joining (NHEJ), which can result in insertion or deletions (InDels), or by Homology Directed Repair (HDR) when a repair Donor DNA template is present. InDels can disrupt expression of the target gene (So called, KnockOut). While repaired by HDR, the genome then was modified with an foreigne gene (So called, KnockIn), or corrected of the target gene (targeted gene therapy). 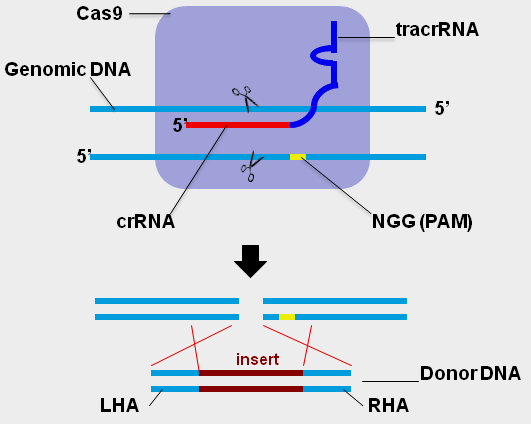 Cas9 is the most frequently used cas endonuclease in CRISPR. 1) Target specific guild RNA (gRNA): it comprises two segments: a targeting sequence (crRNA) containing the target complementary RNA, and an auxiliary trans-activating non-coding RNA sequence (tracrRNA). To make the gRNA, you first select a suitable target sequence, the crRNA region (see online tools for target selection below), and then synthesize the oligo and cloned into a gRNA vector, thus the targeting sequence will be transcribed from the gRNA vectors that embedded “crRNA-tracrRNA” sequence. GenTarget provides a product line for gRNA lentivector cloning kits with which you can construct your desired gRNA lentivectors with desired promoter and selection markers. see our gRNA lentivector’s core map scheme below. 2) Cas9 endonuclease: The gRNA sequence with direct Cas9 enzyme to the formation of a gRNA-Cas9 complex that will bind to target specific genomic loci and cleave the corresponding genomic DNA target sequence. (2) In two lentivector system, it is much easier to construct the gRNA lentivectors by using GenTarget’s gRNA lentivector cloning kit with the options to use the desired promotoer or selection marker in gRNA lentivector. And the standalone gRNA lentivector gives you the flexibility to combined with different Cas enzymes for advanced gene editing. 3) The Donor DNA template (“knock In”): For genomic modification application, a double strand or single stranded repair DNA is required after the Cas9 creates the double stranded breaks at desired genomic loci. (Note: when this Donor DNA is not present, the CRISPR only creates the knockdown). The donor DNA provides the desired sequence insertion that flanked by the gene loci’s homology sequences: left homologous arm (LHA) and right homologous arm (RHA), for the genomic editing via HDR mechanism. This Donor DNA can be single-strand or double stranded DNA which can be simply synthesize and delivered by lipid based transfection or electroporation. Selection of the target sequence within the gene of interest is critical to the efficacy and specificity of genetic editing with CRISPR/Cas9. The crRNA segment of the gRNA will only bind to DNA targets that are immediately upstream of the proper Protospacer Adjacent Motif (PAM) sequence, which for CRISPR/Cas9 is NGG. The target sequence (20bp ~ 30bp) can be in either the sense or anti-sense orientation with respect to the target gene. It is a good idea to create several target sequences for your gene of interest and to select sequences with minimal homology to other genes, in order to find a sequence with good cleavage efficiency and minimal off-target effects. (See the links at the bottom of the page to online bioinformatics tools to assist in selecting a gRNA sequence with minimal off-target effects. GenTarget is proud to offer the standalone Cas9 (Streptococcus pyogenes ) Expression Lentivirus and Adenovirus products. The ready-to-use Cas9 lentivirus are produced from our proprietary high-titer lentivectors that express a nuclear penetrating humanized wild-type Cas9 endonuclease (Streptococcus pyogenes). The Cas9 enzyme is driven by different promoters with a variety of antibiotic selection markers (see the core expression lentivector scheme below), providing you an easy delivery for cas9 expression in almost all cell types, included the hard-to-transfected cell types, primary cells and non-dividing cells, which makes the gene editing possible in all cell types. By separating the Cas9 expression from the gRNAs, you now can construct only the gRNA vectors without the large cas9 insert, which increase both gRNA and Cas9 lentivirus titers, thus increase the genomic edition efficiency. It also makes much easier to edit multiple genes at the same time by using multiple gRNAs. You can use those Cas9 expression lentivirus to generate your desired CRISPR ready stable cell lines or animal model. High efficient Cas9 expression delivery with markers: High titer lentivirus providing more efficient Cas9 delivery in almost all cell 9 types including primary cells and non-dividing cells; Some Cas9 products include a fluorescent-antibiotic dual marker allowing the real-time check the lentivirus transduction efficiency. Best nuclear penetrating for Cas9 enzyme: the Cas9 is expressed with an optimized, proprietary Nuclear Localization Signal (NLS), providing the efficient cas9 delivery into the nuclear region where the gene editing occur. No need for tedious cloning work or vector construction: you can simply synthesize the gRNA (and donor cassette when desired) and used together with the Cas9 lentivirus for the gene editing. Allow multiple gene editing at the same time: no need to construct each targeting vector for different gene. Instead, you just select the target sequence and synthesize the gRNA (each single strand RNA or double stranded DNA cassette) that to used with the standalone Cas9 expression particles. Cas9 lentivirus allow to generate Cas9 standalone expression animal model or stable cell lines in your desired cell types or animals that used as a model for any gene editing. The human codon, nuclear penetrating Cas9 lentivirus are provided in two formats: (1) 200ul in DMEM medium with titer at 5×106 IFU/ml., or (2) 200ul concentrated virus in PBS with titer at 5×107 IFU/ml. Please see each product details below, or see the Product Manual here. GenTarget also provide services to generate your target specific gRNA lentivirus, Please contact us for service quote. Three target specific “guide RNA lentivirus (gRNA)” (0.5 ml x 3) with the desired antibiotic selection marker, as well as a negative control gRNA lentivirus. We design the target specific gRNA sequences, construct the gRNA expression lentivector under U6 or H1 promoter, produce the ready to use gRNA lentiviruses. Please contact us for this service details. Ishino, Y.; Shinagawa, H.; Makino, K.; Amemura, M.; Nakata, A. (1987). “Nucleotide sequence of the iap gene, responsible for alkaline phosphatase isozyme conversion in Escherichia coli, and identification of the gene product”. Journal of bacteriology 169(12): 5429–5433. PMC 213968. PMID 3316184. Jinek, M.; Chylinski, K.; Fonfara, I.; Hauer, M.; Doudna, J. A.; Charpentier, E. (2012). “A Programmable Dual-RNA-Guided DNA Endonuclease in Adaptive Bacterial Immunity”. Science 337 (6096): 816–821. doi:10.1126/science.1225829.PMID 22745249.